It took over two decades for Jamal Hassan to arrive in New Zealand and now he’s asking people to shop for good and give for good to support vulnerable Kiwis. 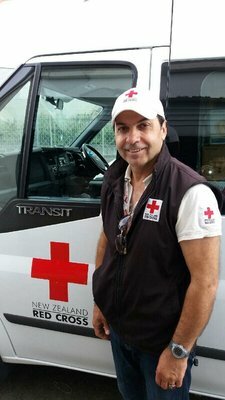 It’s early on a Monday morning and Jamal Hassan is on his way to work at the Red Cross processing centre in Auckland’s western suburbs. Operating from a large warehouse, Jamal and his colleagues collect donations, sort them, and then redistribute the goods to the eight Red Cross retails stores all over the city. It can be a tough and time consuming job with the team sorting through hundreds of donations on a daily basis. Jamal wouldn’t change anything though; he enjoys waking every morning and heading to his job which he found with the help of the Red Cross Pathways to Employment programme. As part of the individualised plan he created with the Pathways team, Jamal began volunteering with Red Cross retail to get some New Zealand work experience and impressed everyone he worked with. When a job at the centre was advertised, Jamal jumped at the opportunity to apply and join a team of people working to support vulnerable Kiwis. “Money isn’t important to me and it makes me happy knowing that I’m working for a charity that’s helping people,” he says. Seeing the donations as he loads and unloads them is one of Jamal’s favourite parts of his work; looking through the clothing, homewares, books, furniture, and linen often brings back memories of the time he spent working in an Iranian marketplace after fleeing his home. In 1993, Jamal fled his home in Iraq with the intention of seeking refuge in Europe. But 17 years later, he was still living in neighbouring Iran, now with a wife and young daughter. Although his wife, Mareyam, is Iranian, Jamal’s heritage was causing some problems and life was becoming progressively more difficult for the young family. Their daughter, Melika, had been forced to drop out of school because her father was Iraqi, the couple had never been issued a marriage certificate, and neither Jamal nor Melika had any official documentation. When two close family members were murdered, Jamal realised he had to do something to ensure his daughters future. It was on this basis that Jamal took his daughter and fled his home once more, beginning a long journey to New Zealand. The pair made their way back to Iraq, trekking for days across the unforgiving terrain of the Zagros Mountain range where they were shot at on more than one occasion. Once back in Iraq, Jamal set to work trying to get some documentation for himself and Melika. The political instability at the time made this more difficult than it should have been and, after six months of trying, Jamal was forced to flee once more. Using false documents, he and Melika made their way to Vanuatu where they registered as refugees with UNHCR. “It really was very hard and difficult but we never lost hope and that’s why I continued my journey with my daughter,” he says. It was there in Vanuatu that they were accepted for resettlement in New Zealand. Two-thirds of the Hassan family touched down in Auckland in 2014, four years after they’d left Iran. As the year progressed, Melika flourished in her new school and Jamal began looking for work. It was a challenging year for the pair though; they were adjusting to their new lives, all the while knowing that Mareyam was still languishing in Iran. There was relief and jubilation when the family was reunited in New Zealand a year later under the family reunification visa. Two years on the Hassan’s have settled into their new lives as Kiwis and Jamal is still excited to be part of the New Zealand Red Cross family. “We work together like a family and we all love each other,” he says. Shopping at or donating to Red Cross shops helps people like Jamal gain valuable work experience as part of their pathway to employment. You can help us support vulnerable Kiwis by shopping at, or donating to, your local store. Stores are often looking for good quality clothing, homewares, books, furniture, and linen.